With a new year often come resolutions and the promise of new beginnings. In the health care arena, 2014 brings the broader rollout of the Affordable Care Act (ACA). With initiatives regarding quality of care tied to payment options, radiologists will need to evaluate both their clinical and business operations. The well-publicized open enrollment issues may skew expectations for large numbers of newly insured patients flooding medical practices. According to Kaiser Family Foundation statistics, about 365,000 people selected a qualified health plan through the ACA between October 1 and November 30, 2013, short of the 500,000 applicants expected to enroll in that time span. According to the December 31, 2013, issue of The Washington Post, 2.1 million people had signed up for private insurance plans through the exchanges, and 3.9 million have enrolled in the expanded Medicaid program by that date. Variables such as these make it challenging to prepare for the ACA’s effects. McGinty is part of a team at the ACR under the leadership of Bibb Allen, MD, FACR, that has created a resource for radiologists called Imaging 3.0 that “embodies principles of appropriateness, quality, safety, efficiency, and satisfaction” in a collection of tools and behavioral changes designed to “optimize high-value imaging care” as radiology health care evolves from volume-driven success to value-driven success. McGinty says Imaging 3.0 is the ACR’s way of helping radiologists be more proactive when it comes to discussions with regulatory agency representatives as well as other medical professionals regarding how to ensure appropriate payment in this new quality-of-care based payment model. The program, incorporated into the ACR’s website, presents information about what radiologists need to do to be in compliance with evidence-based medicine. The site also presents information about how radiologists can provide value throughout a patient’s medical experience, which is a sentiment at the heart of the ACA, she says. Payment Change, but to What? Radiologists are used to the unbundled fee-for-service (FFS) payment system, according to McGinty, but FFS also has been a point of contention in health care for potentially causing increased costs. Getting radiologists to adjust to a new payment model, particularly in the wake of previous reimbursement cuts, is part of the emphasis behind the ACR’s Imaging 3.0 initiative. The ACA also mandates that the secretary of Health and Human Services develop accountable care organizations (ACOs), which will serve as the coordinating center of care among patients, physicians, and hospitals. The ACOs will aggregate providers who meet certain statutory criteria, joined with the goal of sharing responsibility for patient care and reimbursement. The groups also will manage payments between payers and care providers. Another question surrounding ACOs is how bundled payments will be distributed. Radiology Business Solutions CEO Cliff Crabtree says he has yet to see exactly how the transition from fee-for-service to bundled payments will work. “Radiologists need to be part of the solution and not wait for hospitals to make the determinations regarding quality and appropriate imaging utilization,” he says. 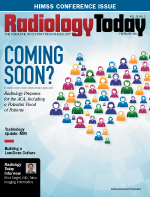 “If payments are going to be bundled, radiologists need to step up and determine how they will get paid for providing evidence-based medicine.” McKenzie says the idea behind establishing an ACO is to carry one patient episode across all medical specialties associated with his or her particular medical issue as opposed to a process in which each area of medicine focuses on its silo within the patient’s overall care. If it is determined that radiology services cost more than the revenue they generate, the number of imaging studies ordered could be reduced, McKenzie says. This could bring financial hardship to freestanding imaging centers and ultimately their closure, meaning more patients would rely on hospitals for their radiology needs. With that, hospitals may need to increase staff to handle higher patient loads, he says. The problem is that all aspects of care delivery are currently tied to relevant quality metrics, McGinty adds. Tracking medical outcomes involves several criteria, from recall rates to patient and referring physician satisfaction. Working in a specialized area such as breast imaging puts Destounis in the position of having more face-to-face contact with the same patients on a regular basis, which provides a consistent level of care that she says speaks to the practice’s quality of service. “In the end, patients are going to decide where they want to go for their breast imaging, so for us, patient satisfaction is important,” she says. Measuring outcomes is another method of showing quality, and with that the national radiology group Virtual Radiologic (vRad) created Radiology Patient Care (RPC) Indices, which consist of a set of findings-based national and peer group radiology benchmarking metrics. The indices were created from vRad’s clinical database of more than 22 million images gathered from more than 2,000 facilities throughout the United States. The first RPC Indices released focus on the use and effectiveness of CT imaging in emergency departments nationwide, which is where the patient care process often starts. Halter says emergency departments are seen as playing a significant role in rising health care costs, with CT being a frequently utilized imaging exam. Those criteria resulted in a large volume of data suitable for compiling and providing information for making appropriate care decisions regarding CT imaging. vRad continues compiling more CT info for future indices, with data gathering expected for other modalities as well. Beyond costs and quality of care, McGinty notes that as more people now can apply for health care benefits under the ACA, there is the potential for expanded numbers of individuals who will be covered. This, in turn, has the potential to increase the need for radiology services. At the same time, however, she says that radiologists must focus on only doing the imaging that is appropriate. Destounis says the bigger concern is that practices will lose patients if they can’t participate in all the ACOs in their community. However, she adds that her facility has sufficient staff and is prepared to handle any new patients. “There may be a slow influx of new patients, but we don’t expect that to occur immediately,” she says. For now, Crabtree suggests that radiologists look to shore up business practices and to understand their current costs and how their business can function efficiently before joining ACOs or forming alliances with other imaging practices. They also need to get on the same page when it comes to staking a claim in the ACO arena.